Students at École Seaforth Elementary spent a week on a cardboard box-based project that was a “magnificent thing.” The school-wide project was inspired by the book The Most Magnificent Thing by local author Ashley Spires. In it a little girl takes random parts, uses her imagination, and creates something wonderful. Students from Kindergarten to Grade 7 were tasked with creating something out of nothing, with the only stipulation that the majority of it had to be cardboard. Principal Wendell Hiltz said at first the kids were a little daunted by the openness of the assignment, which was intended to stimulate creativity and imagination. Students created everything from a mini-classroom to animals and robots. Grade 7 student, Kai, took the project to another level with a working water dispenser that connects to a wireless plug and is operated through an iPad. Grade 4 student Alyson said it was “super fun,” and she explained that her creative choice was inspired by necessity. “We don’t have a foosball table at home, and I always wanted one,” she said. Principal Hiltz credits the timing of the project with contributing to its success. The project took a week to complete. 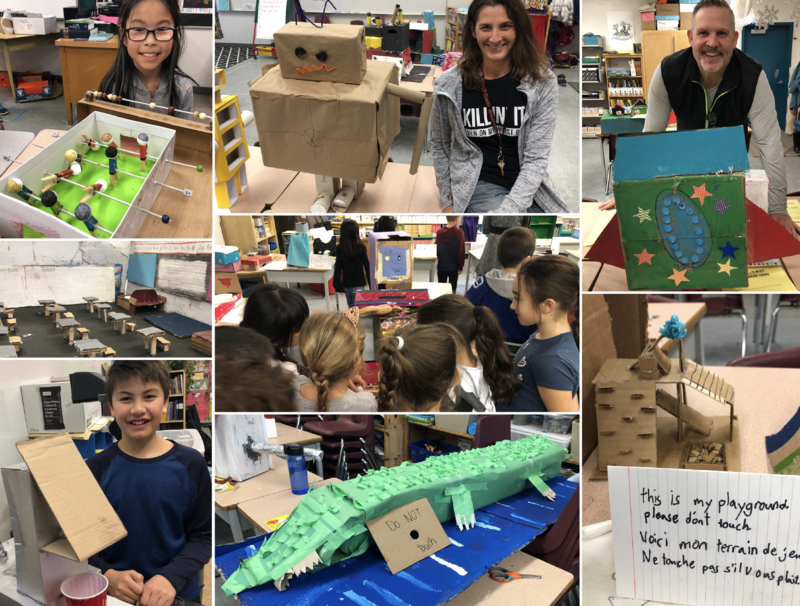 It began with an assembly on Monday and culminated with a “gallery walkthrough” of all the classrooms on Friday, so students and parents could see the creations. The idea came from Grade 4/5 teacher Robyn Scott, whose daughter had done it with her own class, and was so excited that she inspired her Mom. Scott also shared a resource package with her colleagues. It was created by literacy specialist Adrienne Gear for teachers who want to inspire their students to create with cardboard. Nevertheless, the end result is also a most magnificent thing. See for yourself.